The radio this reporter demonstrates is a shortwave version of the Eton FR160. This entry was posted in News, Videos and tagged Al Jazeera, Eton FR160, Freedom of Press, Shortwave Radio Ban, Why Radio, Why Shortwave Radio, Zimbabwe, Zimbabwe Radio Ban on March 8, 2013 by Thomas. 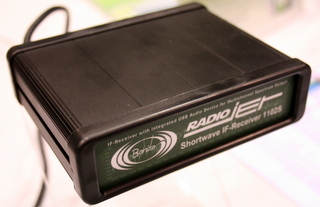 The shortwave Eton Microlink FR160 is one of the noted “specially-designed radios” capable of receiving international broadcasts (like those from the Voice of America) which might compete with state-owned stations. If shortwave radio is no longer relevant in today’s high-tech world, why are these radios suddenly being banned in a country controlled by a repressive regime? Media freedom campaigners said Friday police in Zimbabwe are breaking the law by seizing and banning small radio receivers that can tune in to stations not linked to the state broadcasting monopoly controlled by President Robert Mugabe’s party. The Media Institute of Southern Africa said Friday no regulations outlaw the hand-cranked, solar powered radios that democracy and election support groups plan to use ahead of a referendum on a new constitution next month and crucial elections later in the year. Police insist the radios and cheap Chinese 3G smartphones with GPS capability are being supplied by “subversive organizations” and pose a security threat surrounding the polling. […]”The importance of a radio set cannot be overemphasized as it is a generally affordable legal gadget used for receiving information by the public,” the group said. Police efforts to “criminalize the distribution and possession of the radio sets” infringed citizens constitutional rights to freedom of expression and basic civil liberties,” it said. Such radios and other equipment were seized in recent police raids on the Zimbabwe Peace Project, a human rights group that monitors political violence, and the independent Zimbabwe Election Support Network. Police allege those and other groups were planning to mobilize “recruits” with unauthorized communications devices in rural districts across the country, traditionally voting strongholds of Mugabe’s party. The Elton [Eton, actually] Microlink radio, at a cost of about $30, has channels able to receive Voice of America broadcasts beamed in from neighboring Botswana and shortwave broadcasts on Zimbabwe from Europe. The state Zimbabwe Broadcasting Corp. has four radio stations fiercely loyal to Mugabe. State and independent newspapers are not commonly found in impoverished rural districts where communities rely for information on radios only receiving state radio and powered by batteries that are often in short supply. Police warned this week that the activities of some Western-backed non-governmental organizations and rights groups now verged on espionage. People found in remote areas with the cited devices could face arrest. This entry was posted in News and tagged Eton FR160, FR160, Shortwave Radio, Shortwave Radio Ban, Why Shortwave Radio, Zimbabwe on February 23, 2013 by Thomas. One of the most popular posts on the SWLing Post each year is the annual Holiday Radio Gift Guide. I started this annual post in 2010 when I realized that it would be easier than answering an in-box full of individual emails from people seeking the perfect shortwave radio for their friend or loved one. In the following, you’ll find a handful of select radios I recommend for this gift-giving season. I’ve arranged this selection by price, starting with the most affordable. I’ve included a few promising new radios that have recently been introduced to the market, along with models that have proven their reliability and are on their way to becoming classics. For the benefit of those with less radio experience, this quick guide is basic, non-technical, and to the point. For more comprehensive reviews, please consult our Radio Reviews page. Updated for the 2012-13 holiday season on 22 November 2012. The Kaito WRX911 is a classic, no-frills analog radio. Turn it on and tune. That’s its game. 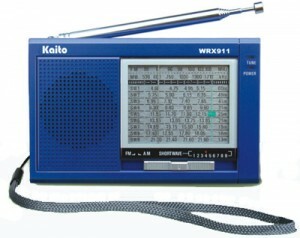 You can purchase the Kaito WRX911 from Universal Radio. No matter where you live,you should have a self-powered radio in your home. The Eton FR160 is like a Swiss Army Knife when power fails. A good friend recently sent me a message: she had been without power in the wake of Hurricane Sandy for two full weeks. She also added that her little FR160 kept her family informed and provided comfort in the dark days following the hurricane. Over the past few years, these radios have become ubiquitous. I’ve seen them in sporting goods stores, RadioShack (Tandy in some countries), BestBuy, Target, Bed Bath and Beyond–indeed, they’re in practically every North American big-box store and in many mail order catalogs besides. Of course, Universal Radio sells them, too. 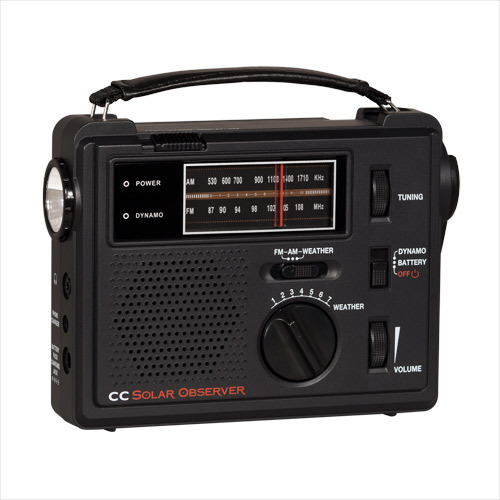 Like the FR160, the CC Solar Observer is a wind-up/solar emergency radio with AM/FM and Weather Band, and an LED flashlight built into the side of the radio. It’s perhaps a nicer option for those who want bigger audio out of their emergency radio. The Solar Observer is rugged and well-designed, like many C.Crane products. The CC Solar Observer is available at C.Crane. Eton and C.Crane sell many other self-powered radio models. If interested in exploring more models, check out our self-powered/emergency radio reviews. 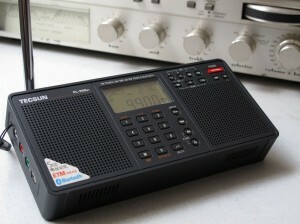 The Tecsun PL-398BT is a very unique shortwave radio. In fact, it may be the perfect gift for a radio enthusiast who is also very tied to their computer or smart phone. Besides being a very capable shortwave/AM/FM receiver in its own right, when put into Bluetooth mode and connected to a smart phone, PC, or other device, the PL-398BT’s speakers act as its wireless stereo speakers. I believe this may be an ideal way to listen to internet radio from your iPhone, for example. Of course, the PL-398BT comes from a legacy of great receivers, so the AM/FM and shortwave performance will not disappoint. It’s a little on the pricey side for a shortwave radio that lacks the SSB mode (for listening to utility and ham radio transmissions), but the Bluetooth function more than makes up for it, in my opinion. Some people may definitely prefer this function. You can purchase the PL-398BT from Universal Radio or you can click here to search eBay. The Grundig G3 has a solid reputation and at $100, great value for the performance. Simply put, the Grundig G3 offers the best bang for your buck in 2012. I have a lot of portable radios, but the one I probably reach for the most–for recreational shortwave radio listening–is the Grundig G3. I wrote this review three years ago and even recently posted this update. Read them and you’ll see why I like the G3. At $100, the G3 will please both the shortwave radio newbie and the seasoned listener. The Grundig G3 can be purchased from Universal Radio or Grove. Some local RadioShack stores also keep the G3 in stock (though unfortunately, less often than they used to). Of course, two other excellent (though pricier) options are the Tecsun PL-660 and the Sony ICF-SW7600GR. If $500 is within your budget, and you’re buying for someone who would love combining their radio hobby with computer technology, a software defined receiver (SDR), like the RFSpace SDR-IQ, will certainly exceed their expectations. There are many SDRs on the market, but the SDR-IQ offers the most bang-for-the-buck in the SDR line (though the WinRadio Excalibur ($900 US)–which we recently reviewed–and the Microtelecom Perseus ($1,000 US) are certainly pricier benchmarks worth considering). 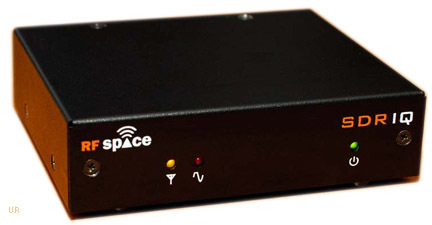 The RFSpace SDR-IQ is available from Universal Radio and is manufactured in the USA. The Bonito RadioJet is new to the North American market in 2012. I reviewed the RadioJet this summer and even traveled with it extensively. I was thoroughly impressed with its portability, performance, and it did not task my PC as much as SDRs do. Like the SDR-IQ, it’s a small black metal box that hooks up to your PC to unlock its impressive features. The RadioJet, though, represents cutting-edge IF receiver design, and comes with an amazingly versatile software package. If you’re buying for someone who likes versatility and raw performance–and likes being an early adopter–the Bonito RadioJet may well be the perfect fit. The Bonito RadioJet can be purchased from Universal Radio and is manufactured in Germany. We featured the Alinco DX-R8T in last year’s holiday gift guide. We also gave it a full review–in short, this radio thoroughly impressed us. It’s full-featured, performs well, and comes at a very affordable price. If you’re buying this for a ham radio operator, they’ll understand the reason why the Alinco DX-R8T needs a 12 volt power supply and an external antenna. It’s a receiver version of a ham radio transceiver, and as such, does a fine job on SSB modes. Want more gift options? Try our 2011 or 2010 gift guides, take a look through our shortwave radio reviews guide and/or our simplified reviews page. This entry was posted in Emergency Preparedness, Radio Gift Guide, Radios, Reviews and tagged Alinco DX-R8, Alinco DX-R8T, Black Friday Radios, Bonito 1102S RadioJet, Bonito RadioJet, Bonito RadioJet IF-Receiver 1102S, C.Crane Solar Observer, Eton FR160, Grundig G3, Hurricane, Hurricane Preparedness, Hurricane Sandy, Kaito WRX911, RFSpace SDR-IQ, SDR-IQ, Shortwave Radio Christmas Gifts, Shortwave Radio Gift Guide, Sony, Tecsun PL-398BT, Tecsun R-911 on November 22, 2012 by Thomas. In Emergency Preparedness Part 1: Choosing the right radios, we focused on various types of radios you should consider having on hand in times of disaster. This section focuses on other aspects of emergency preparedness. Of course, there’s more to the art of being prepared than simply purchasing a few radios. Being prepared is about having enough supplies, making a plan, and knowing how to get in touch with family/friends, where to meet and what to do should you lose contact. Fortunately, a great percentage of the time, being prepared is about dealing with a few days–not months–of difficult conditions. What I’m trying to say is, don’t feel like you have to spend a lot of money stock-piling months of food, or buy several bricks of gold to bury at your house (hate to burst your bubble, but gold is, unfortunately, a rotten investment). Don’t feel like there’s a financial barrier to being prepared, either. It’s easy, and you can gather everything you need in one day. I find that the Federal Emergency Management Agency (FEMA) has a well thought-through list of items you should have in your preparedness “kit.” I have listed them below (courtesy of FEMA) and included my own comments under some of the suggestions. Distilled water is inexpensive and very easy to store. I suggest purchasing inexpensive gallons of distilled water from your local store. When you bring them home, mark them with the date purchased. Over time, you can use and replace them with new ones. Include a lot of shelf-stable foods ready to be eaten without preparation–trail mix, dehydrated fruits and vegetables, etc. We’ve covered this one pretty thoroughly, haven’t we? At least have a Gerber or Leatherman tool with a built-in pair of pliers. 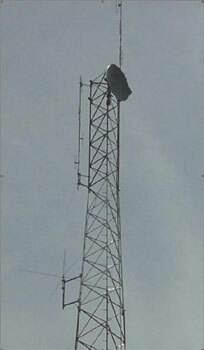 Many of the radios above can charge a USB-based cell phone. If you are looking for a durable solar panel, consider the Goal Zero foldable panel or any roll-up/foldable panel by Power Film Solar. This is extremely important–you should certainly stock up on medical supplies if you’re in the path of a natural disaster like a hurricane. Pharmacies may be closed for several days and you certainly want your prescription heart medication on hand! Don’t forget Rover or Whiskers–! Important family documents, such as copies of insurance policies, identification and bank account records in a waterproof, portable container. You can use the Emergency Financial First Aid Kit (EFFAK) – PDF, 277Kb) developed by Operation Hope, FEMA and Citizen Corps to help you organize your information. Emergency reference material, such as a first aid book or information from www.ready.gov. Complete change of clothing, including a long-sleeved shirt, long pants and sturdy shoes. Consider additional clothing if you live in a cold-weather climate. Household chlorine bleach and medicine dropper – When diluted nine parts water to one part bleach, bleach can be used as a disinfectant. Or in an emergency, you can use it to treat water by using 16 drops of regular household liquid bleach per gallon of water. Please do not use scented or color safe bleach, or bleaches with added cleaners. Often overlooked, but quite important–you may be without power, television and internet for days. You should have a back-up plan for your children. Board games are fun, burn a little time, and require absolutely no batteries! Fill up your vehicles with fuel. Indeed, it’s not a bad idea to top-off your fuel on a regular basis. Listen to local radio stations and follow any directions from local officials who are coordinating recovery. Being prepared, as I said earlier, is more than just having supplies. It’s about being prepared mentally and having your close family and friends on the same page should disaster strike. Also, you should be well aware of how things are handled locally. Ready.gov has an excellent guide to making a plan (including downloadable forms) and general information about being informed. Check to see if your national weather service has specific frequencies with weather or emergency information. If so, make sure you have a radio that can receive these broadcasts. Check with your local emergency management office. If you have any specific needs (medical or otherwise), make sure your local authorities know. This is, perhaps, one of the longest posts I’ve ever written on the SWLing Post; you can probably tell that I’m an advocate of preparedness. I hope I’ve shown you that there’s a lot to think about prior to a disaster, whether natural or man-made. It’s not expensive to prepare, but does take a bit of dedicated time and energy. Once you you do it, though, I promise that you will feel better prepared and more secure than before. And one more thing: once you’ve taken care of your own or your family’s needs, please be prepared to help others however you can–sharing and caring is part of any disaster recovery process. This entry was posted in Articles, Emergency Preparedness, Preparedness, Slightly Off Topic and tagged crank radio, disaster preparedness, Emergency Radios, Etón, Eton FR160, Eton FR160 Review, FR160, Grundig, Hand Crank Radios, How to be prepared, Items for being prepared, National Preparedness Month, NOAA, NOAA weather radio, Preparedness, Preparedness Radios, Radios for Emergencies, Self-Powered Radios, Solar Radio, What supplies you need in natural disaster, wind radio, wind-up radio on September 11, 2011 by Thomas. Today is the 10th anniversary of the 9/11 terrorist attacks here in the US; also, here in the US, September is National Preparedness Month. These two facts, coming as they do on the heels of several recent natural disasters in the US (hurricane, flooding, fires, an earthquake) have meant that I’ve received several inquiries about what radios (and supplies) are best for emergency preparedness. So, I’ve decided to offer a comprehensive guide to preparedness. It includes specific suggestions for radios and other supplies (food, medical, etc.) one should have in stock in case of an emergency. I’m no preparedness expert–and I’m certainly not a devotee of apocalyptic thinking–but in the rural area where I live, in a passive solar home, preparedness is an everyday fact. Power from the grid goes out here frequently, and when it snows, we can be stuck out here for a day or two at least. When weather or other problems occur, as they invariably do, we’re guided by the three emergen-Cs: we simply stay calm, use common sense, and solve any problems creatively. We keep several days of food in stock, have on hand emergency lighting, a generator (which we regularly maintenance), and spare fuel for the generator; meanwhile, my ham radio station can run on a fully-charged battery bank for days. Our refrigerator and freezer are solar-powered with battery back-up as well. When the power goes out, we may notice it, but only just. We also believe in helping the neighbors whenever we can. Oh, and a sense of humor helps keeps things in perspective. As this thought-provoking video points out, no matter where you live in the world, communication is one of the most important ways you can maintain control when the world around you is out of control. 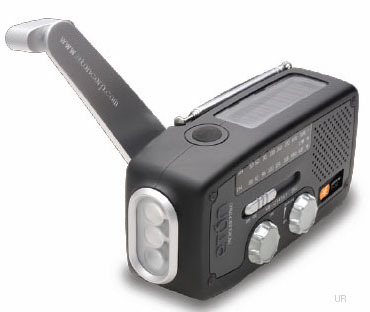 One self-powered (hand-crank) radio with AM/FM and emergency flashlight. If you live in the US, this radio should also include the NOAA weather radio frequencies. One capable digital portable shortwave radio with SSB (single-side band) mode. I’ll start with recommendations of self-powered radios, then suggest a few portable digital radios and self-powered shortwave radios. Finally, I’ll also include FEMA recommendations for supplies that should be kept on hand for emergencies, just in case. Below, I’ve laid out what I consider to be the best self-powered radios on the market today. Note that many of these radios cannot receive on shortwave, but do receive AM/FM and NOAA frequencies (NOAA weather frequencies are only helpful in the USA, please remember). 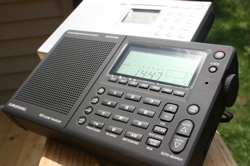 During natural disasters or in times of emergency, local AM and FM stations tend to be more information-relevant than international broadcasters on shortwave. Of course, I believe you should have a shortwave radio on hand as well, so I have also provided a list of self-powered shortwave radios. 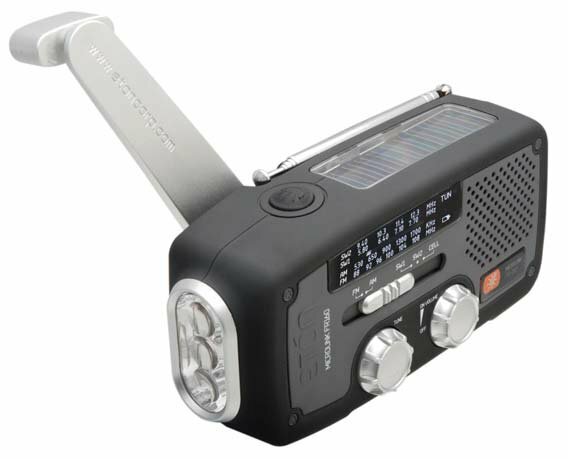 The Eton FR160 is a durable, portable hand-crank and solar powered AM/FM Weather Band radio. It’s quite easy to use and does a fine job tuning in local stations including NOAA weather radio (you can chose from a selection of all seven frequencies). The FR160 has another very useful feature–you can connect any USB-based charger into its built in USB port and use the radio’s hand crank to charge your cell phone or other portable USB device–very cool! Be aware that it takes a lot of cranking to charge a typical cell phone enough for a 5 minute phone call, but in an emergency, it’s worth the trouble. 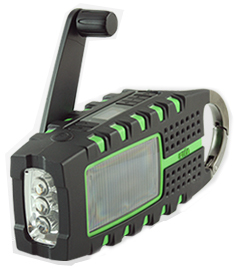 The built-in LED flashlight is also very bright and lasts a long time on 2 minutes of cranking. The solar panel is adequate for charging the radio or for playing it (in full sunlight). The Eton Scorpion self-powered AM/FM Weather radio with built-in caribbeaner and bottle opener! The Eton Scorpion is very similar to the FR160, but has the added features of an auxiliary line-in input, a larger solar panel, and is splash-proof. The Scorpion has an aluminum carabineer to attach it to your belt or pack, a bottle opener, and is overall a very rugged device, so is ideal for camping, too. Eton Corporation also produces the Axis and Rover–I have never used these, but assume they would be worth considering. Eton is certainly the king of self-powered radio technologies and produces many of their radios branded with the Red Cross. They’re sturdy and effective. I know of no self-powered weather band radios as reliable as those produced by Eton. The Grundig G3 or Sony ICF-SW7600GR (in background) are both reliable and have excellent SSB reception. I strongly recommend you have a capable, full-fledged digital shortwave radio tucked away for emergencies. If you already own one, just make sure you always have fresh batteries for it standing by. What radio, specifically, am I talking about? Basically any radio I have listed on our main reviews page that has SSB capabilities. With SSB, you can tune to the ham radio bands and listen to information which amateur radio operators (both locally, and across the globe) are sharing. 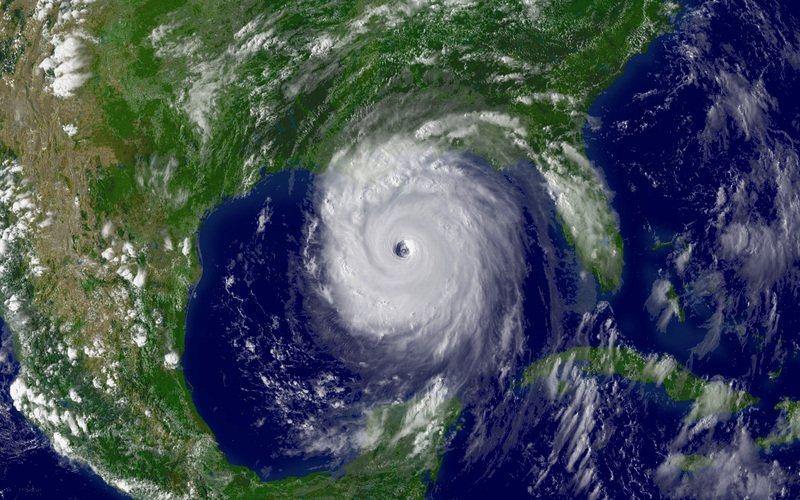 If you’re riding out a hurricane (or living in the aftermath of one, such as Hurricane Katrina) SATERN or the Hurricane Watch Net could provide invaluable, immediate and practical information for your situation. You will need SSB to hear them. I actually wrote a tutorial on listening to hurricane watch nets here. Still on the market as the Tecsun Green 88, this little self-powered radio packs a big punch. My all-time favorite self-powered shortwave radio is the Grundig FR200 or Tecsun Green 88. This radio used to be widely available as the Grundig FR200, but Grundig has since stopped producing it. The radio can, however, still be purchased by Tecsun Corporation from vendors in Honk Kong on eBay (link provided below). I’m also very fond of several other self-powered shortwave radios, but none of them quite match up to the Tecsun Green 88 (Grundig FR200). I’ve listed a few below that are certainly worth considering. 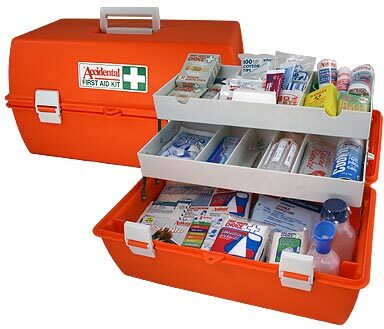 Click here to read Emergency Preparedness Part 2: All the basics for emergencies.